Mohamed ElGhatit is a founding partner of OGH Legal as well as the UAE office’s CoManaging Partner. Previously, Mohamed ELGhatit was the Director of the DIFC-LCIA Arbitration Centre. And before that he was the acting leader of Hogan Lovells Middle East Disputes’ practice in the GCC. Mohamed ElGhatit read law at, Cairo University, National University of Singapore and Cornell Law School. He has more than 14 years’ experience working in the Middle East. Mohamed ElGhatit regularly acts as counsel and arbitrator in a broad range of complex and transnational disputes in various sectors including real estate, construction, oil and gas, IT, hotels and tourism and banking. Mohamed spends a significant portion of his time advising on engineer and general construction disputes. He has handled cases under most of the major arbitration rules, including ICC, LCIA, DIAC, CRCICA, and UNCITRAL. He has sat as sole arbitrator on around two dozen cases in Dubai only. Mohamed ElGhatit also advises clients in Court litigation. 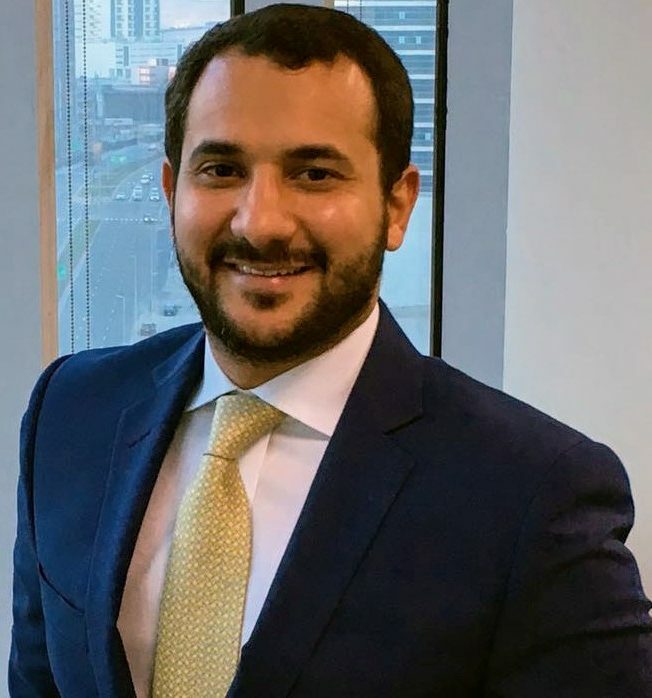 He has been involved in Court litigations in numerous jurisdictions primarily in, Egypt, Qatar, Saudi Arabia, and UAE (including DIFC) as well as in England. He has been recognised in a number of industry publications including Legal 500 and Chambers where he is seen as: a “tremendous asset” and “a bilingual lawyer with a solid knowledge of litigation.” “Mohamed ElGhatit’s Arabic fluency and extensive litigation and arbitration experience make him a useful figure for corporate and government clients. His clients come from sectors such as construction, telecoms, IT and energy. ” Chambers Global “Singled out for his excellent communication skills, versatility and ability to bridge the gap between common and civil law. • Acting for Taaleem PJSC, in relation to a dispute arising out of a USD 350 million property investment situated in the DIFC. The decision established for the first time the grounds where the DIFC Courts will retain jurisdiction (UAE). • Acting for two North African sovereign wealth funds in respect of investment relationships where there are suggestions of possible misconduct and fraud and assisting in formulating exit strategies (various). • Acting for a contractor on a US$2bn dispute with the employer of a mega project in Saudi Arabia. • Advising a contractor consortium in relation to a mega hotel and residential project in an ICC arbitration with a value of approx. US$60m. • Advising the employer in a dispute with contractor in relation to a hotel with a value of US$40m. • Acting for a US fortune 500 company in a CRCICA arbitration arising out of a joint venture dispute. • Acting for a leading US media company in a UAE Court litigation, value of the claim was approx.. US$100m. • Co- counsel in an adhoc arbitration between a state owned enterprise and foreign investor involving a EGP 1.2 billion (then valued at US$300m) real estate dispute. • Advising an Egyptian IT company in complex dispute avoidance negotiations with a leading European bank. • Acting for a US petroleum services company in a CRCICA arbitration with its local, Egyptian, partner on profit distribution valued at US$55m. • An Egyptian construction conglomerate in an ICC arbitration involving a joint venture for the development of a major real estate project in Alexandria (Egypt). • Acting for an Egyptian group of companies against a leading global IT company in an LCIA arbitration with claims valued at US$20m. • Acting for a major Indian telecommunications conglomerate in relation to a dispute arising out of a cable construction and installation contract in Jordan in an LCIA arbitration. • A US Fortune 500 engineering company in relation to a construction dispute for unpaid work relating to a major sports arena in the UAE claimed value was approx. US$30m. • Acting for a major international contractor specialising in the design and installation of computerised building control in a DIAC arbitration. • Advising a major GCC state-owned energy company in relation to major complex and multijurisdictional high profile employment litigation. • Acting for an oil and gas UAE company in relation to a dispute with its local partner. • A global engineering firm in relation to an ad-hoc arbitration arising out of contract for the construction of a medical facility (Qatar). • A regional pharmaceutical distributor in relation to a dispute with a German pharmaceutical company (Kuwait). • A Libyan company in relation to a shipping dispute regarding repossession of a vessel in Africa. • An international contractor on a range of issues in relation to the construction of a major airport facility in the Middle East. • An international supplier in respect of delay of payment claims on a major port project in the GCC, in excess of US$100m. • An international contractor in an ICC arbitration for recovery of extra cost claims in respect of two desalination plants in the GCC. • A local UAE court litigation between a Chinese contractor in the UAE courts in respect of claims for additional costs relating to a sports facility. • The mandated lead arrangers on the successful project financing of the Fujairah Oil Terminal, awarded Middle East Oil & Gas Deal of the Year 2013 by Project Finance magazine. • A matter between international contractor in respect of its bid to be the delivery partner for the 2022 World Cup in Qatar. • Acting for concessionaire in successfully negotiating BOT and BOO contracts relating to power plants in Egypt. • A UAE construction company on a joint venture to build a medical facility in Egypt. • In a mammoth cooling system for Smart Village (Cairo E City). • Advising on concessions in respect of coal mining at Ein El Sokhna. • Acting for a bidder in relation to an Egyptian cement production license. • Advising on claims arising out of BOT contracts relating to Abu Sultan power plant in Egypt. • A government entity on the development and financing of a power plant, a refinery and a pipeline project in Iraq (Nineva). • Representing an international contractor on a dispute relating to the financing, construction, operation and maintenance of wastewater treatment plants in Fujairah. • Advising on claims arising out of concessions in respect of coal mining at Ein El Sokhna (Egypt). • On a CRCICA arbitration between two Egyptian Media Companies.